Parkview celebrates after winning the Georgia Class 7A state championship. 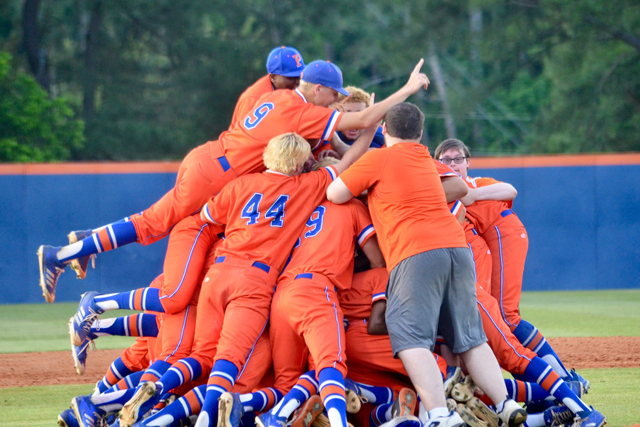 A month after Parkview High School captured the Georgia High School Association Class 7A state championship, the Panthers were named the national champions by Baseball America. It's the third time in seven years the magazine named the Gwinnett County baseball program as its national champion. Parkview was named the national champs in 2012 and '15. The 2015 squad was named national champions by five major media outlets. Parkview, however, wasn't the only Georgia team ranked in the final Baseball America poll. Pope, the Class 6A champions for the second straight year, was ranked eighth. Class 7A state runner-up Mill Creek was ranked 30th, while Blessed Trinity finished No. 46. Loganville, who captured the Class 5A title for the second straight year, was ranked No. 50.